One very cool thing indeed about moving to London and setting up shop in a new apartment are the vintage possibilities. In a very old city that has accumulated a lot of very old stuff, there is a constant turnover of furnishings and decor as it’s out-with-the-old, in-with-the-new…or in-with-the-old, for that matter. Turn on the telly and you’ll see that antiquing is a classic British pastime. The UK is where the “Antiques Roadshow” was born, and shows like “Flog It!” reflect the popularity of auctions. You can go highbrow at one of the Christie’s fine art salerooms on King Street or Old Brompton Road in London, or just take antiquing at your own pace without the competitive pressure of bidding with a stroll through any of the famed Portobello Road shops. 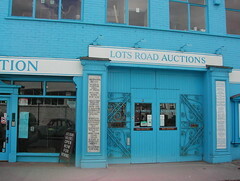 If you’d like to give the live auction scene a try, though, check out Lots Road in Chelsea. Located just off the King’s Road, this massive saleroom auctions hundreds of lots every Sunday. Both antique and contemporary goods are for sale, which you can browse at their website or just visit first-hand.